Big Eastern US Coffee Championships Come to Durham! The Triangle is going to be the center of the east coast coffee scene this weekend. 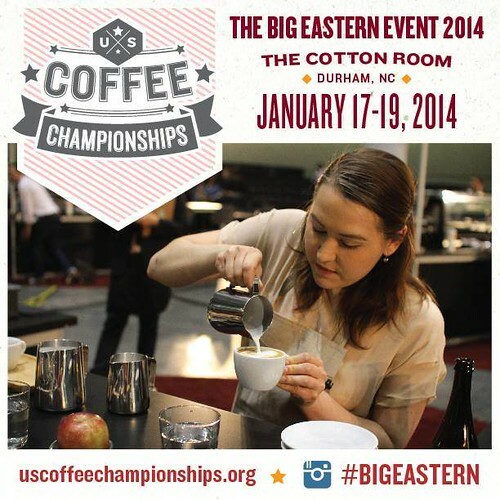 The “Big Eastern” US Coffee Championships will be held at the Cotton Room in Durham this weekend (January 17th-19th). The event is hosted by Counter Culture and Dallis Brothers Coffee. The event will be 3 full days of coffee competitions featuring the top baristas in the region. It is FREE and open to the public. I am volunteering at the event but will also have down time to watch the Barista and Brewers Cup competitions as local and regional baristas battle it out for the regional titles. The Big Eastern encompasses 21 states across the eastern seaboard drawing baristas from up and down the coast. Competitors train months in advance. They spend countless hours developing their own “signature drinks” and presentation styles taking great care in selecting their coffees, brewing devices, music selection and perfecting their presentation techniques in hopes of impressing the judges and securing the regional title. There are 13 local baristas registered for the event. Their competition times below are provided below. View the full schedule the “Big Eastern” competition here. If you can’t attend the event in person you can still follow the action Live online all weekend long. Sprudge is broadcasting the event on livestream. Watch the BigEastern Livestream here. What an amazing experience, I heard that Todd Carmichael won the North East brewers cup. He did! It was an incredible event. I am so glad it was held right here in Durham!